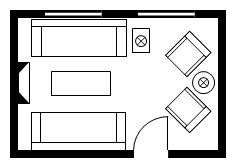 If you want to share a bathroom between two bedrooms then these Jack and Jill bathroom floor plans might work for you. 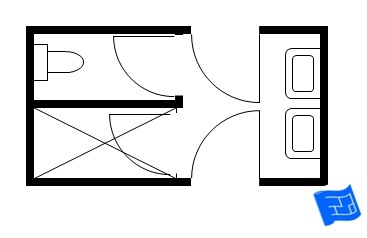 A Jack and Jill bathroom is a bathroom that has two or more entrances. 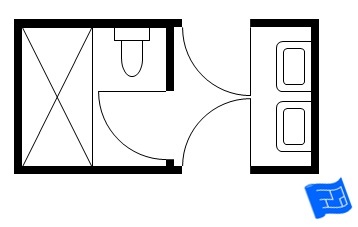 Usually the entrances are from two bedrooms but there might be an one entrance from a bedroom and one entrance from the corridor. I’ve put together some layouts to inspire a design to work for your situation. And there's even layouts that get over the locking door problem! 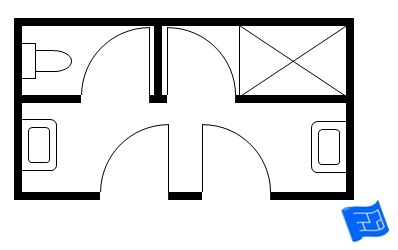 Here’s a compact Jack and Jill bathroom floor plan. It’s shown here with a luxury shower size but you can replace it with a bath in if you prefer. 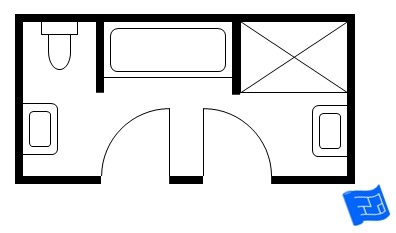 Here's a larger Jack and Jill layout with a double sink and a bath and a shower. 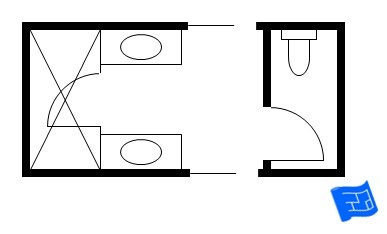 Another option is to put the washbasins in the bedrooms which means this bathroom layout can accommodate both a bath and a shower. Now – just a few words of advice before you go down this route. The big thing about these bathrooms is locking the doors. The trouble is you either forget to lock both doors before you go about your business, or you forget to open them both afterwards. If you’re Jack it’s really annoying when Jill forgets to unlock the door on your side. Then the only way to get to the bathroom is to shout to Jill to open the door, or go all the way round into her room and into the bathroom. Not great if you’re desperate for the bathroom. There are some special locks available. The other side of the door locking problem is that you need an extra lock inside each of the bedrooms if someone wants to lock their bedroom. Here’s another bathroom layout which gets over the doors locking problem. People can handle brushing their teeth and washing their face or hands in a semi-private situation. So here the Jack and Jill arrangement opens onto two sinks (now that I think about it the doors might be better swinging outwards or even better, pocket doors). Then for private activities (toilet and shower or bath) there’s one door – no locking problem. The only downside is that it requires a bit more space - perhaps to the extent that there would be room for two small en suite bathrooms. But then you've the expense of two sets of fixtures. I was at the gym and an idea occurred to me. The gym has cubicles for toilets and cubicles for showers and they're both around the same size. Check out how that could be applied. 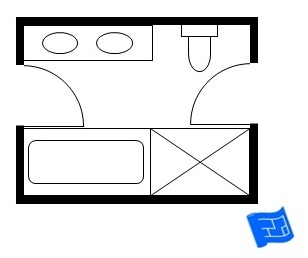 In the layouts below you've got a private shower and a private toilet. For the shower door frosted or etched glass would be ideal. There's enough room in a shower like this to hang your towel the opposite end of the shower without it getting wet and then towel off inside the cubicle. So if Jack and Jill don't mind seeing each other wrapped in a bath towel this can be another answer to avoiding the locking door problem - AND it means that the toilet and the shower can be used at the same time. One of House Plans Helper's readers (Hi Maggie) wrote in to tell me about the jack and jill bathroom they had as kids. It's not exactly the layout below but near enough. There are two toilets and sinks and a central shower. Apparently there was lots of fun to be had with cold water being thrown on the poor person in the shower. 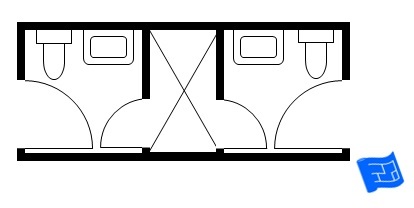 Here's two layouts with the entry doors on the same side - one with the locking problem, one without. There are fancy locks available which will lock both doors when one door is locked. If you stop and think about it though, if you're locking one door, the other door has to be closed in order to lock so this still doesn't wholly solve the problem. And the electronics required to make the lock work cost a pretty penny. I had a system priced up by and it came to over $900 no including installation!!! and it was a bit industrial looking. If anyone out there knows of a cheaper Jack and Jill locking system I'd love to hear about it. Go ahead and contact me to tell me about it. 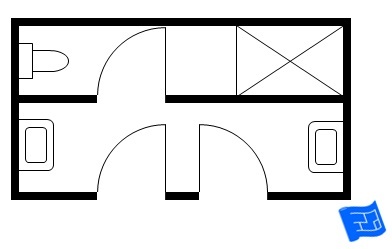 House Plans Helper reader Janet got in touch with this suggestion. I saw a system in a swimming pool changing room in the Netherlands. 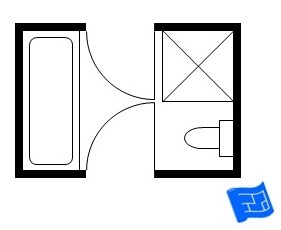 When in the cubicle with both doors closed, a seat/bench (that ran along the full length of the wall at a right angle to the doors and which is normally folded up flat against the wall) is folded down preventing the opening of both doors. The seat is then raised and folded back flat against the wall and you can open the doors again. 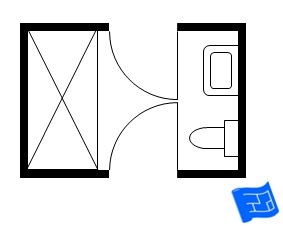 The onus then lies on Jack or Jill to keep their door locked when not using the bathroom, and when they are using the bathroom both doors are automatically closed.